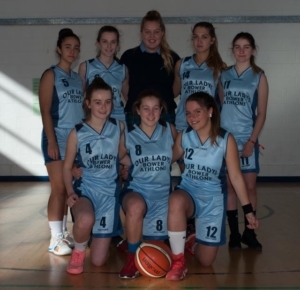 After a “lengthy” bus journey, the Bower under 16s started the game a little off the pace and Presentation De La Salle Bagenalstown got their noses in front by a basket in the first quarter. To make matters worse Hannah Dickie picked up an ankle injury after less than a minute and had to sit out the rest of the game. The visitors changed to man to man defence in the 2nd quarter to try and take the home team out of their comfort zone and it paid off. Their tough defence kept PDLS to 7 points and allowed point Guard Faith Greene to find Keeva Reid on her way to the basket for 6 points in the quarter. Faith had another 6 from the floor and one from three point range. This left the score at 24 to 14 in favour of the Bower at half time. The third quarter was a more even affair, with the home team adapting to the man to man defence a little better and they netted 10 points in the period. The two new Spanish players for the Bower got in on the scoring, with Maria Navarro taking a knock on the way to the basket, making her score and the free throw. Maria Grinar got to the basket for a lovely score after beating two defenders on the way. Keeva Reid, still a scoring threat got in for 7 more in the quarter. The scores at the end of the 3rd period – DLS 24, Our Lady’s Bower 36. Man to man defence for the whole game can have a powerful effect on the team on the receiving end. It usually increases the amount of mistakes they make. This was true of PDLS, the longer it went on the more opportunities the Bower got. This type of up tempo defence usually tires the team playing it but it didn’t seem to have that effect on the Bower girls, they seemed to get stronger as the game progressed. The visitors put in a very strong performance on the day and left Bagenalstown worthy winners, 49 points to 32. The home team started very well, making the most of scoring chances and putting 15 points on the scoreboard. The visitors had quite a few chances, not converting all of them but still making 8 points, keeping them in the game. The 2nd quarter was a replica of the 1st with the Bower girls making 8 points and PDLS making 16. This left the Bower down by 18 at half time with the score of 32 points to 16. With the home team in control, the Bower needed to change defence and upset them a bit to get a foothold in the game. They changed to a pressing man to man in the 3rd quarter and did exactly that. For the Bower it was their best period of the whole game, they outscored PDLS by 23 points to 17. A very fired up Niamh McGann led the way with steals in the quarter. Guards, Faith Greene and Grace Halligan both had scores from the 3 point line and Maria Navarro and Keeva Reid finished runs to the basket with good scores. Unfortunately the energy expended and the pressing defence took its toll and a tired Bower team left the floor at full time, well beaten by the home side. The final score; Presentation De La Salle 65 Our lady’s Bower 49.